Clarissa Kell | Daily Press Gladstone seniors Ethan Dawson, left, and Jared Crow work on projects as Dylan Anderson, shown at back, walks away from the table during third hour Thursday. The students are part of a safety incentive program started by their teacher, Mark Cousineau. The Gladstone High School shop teacher created a way to promote safety in his shop by partnering with the Verso paper mill in Escanaba. GLADSTONE — Safety in a school woodshop is just as important as safety in an industrial facility. The Gladstone High School shop teacher created an unique way to promote safety in his shop classroom that led to a partnership with the Verso paper mill in Escanaba. “I worked many years in industry before I came into education, and safety is such a big factor in industry. I wanted to bring that into the classroom and make sure the students understand that so when they enter the workforce they’re prepared,” said Mark Cousineau, the woodshop teacher who implemented the safety reward system at Gladstone High School. This is Cousineau’s first year teaching at Gladstone and the program started the second semester. When the program started, he explained to his students the various hazards of the industrial workplace and made sure his students followed the same safety rules and procedures that would be expected of them in an industrial environment. It is the students selected from their peers anonymously for going above and beyond in the class shop who are recognized and rewarded through the new program. A student from each class period is selected each month for excelling at working safely. “They voted for their classmate that felt represented safety and worked the safest. They do that at the beginning of each month,” Cousineau said. 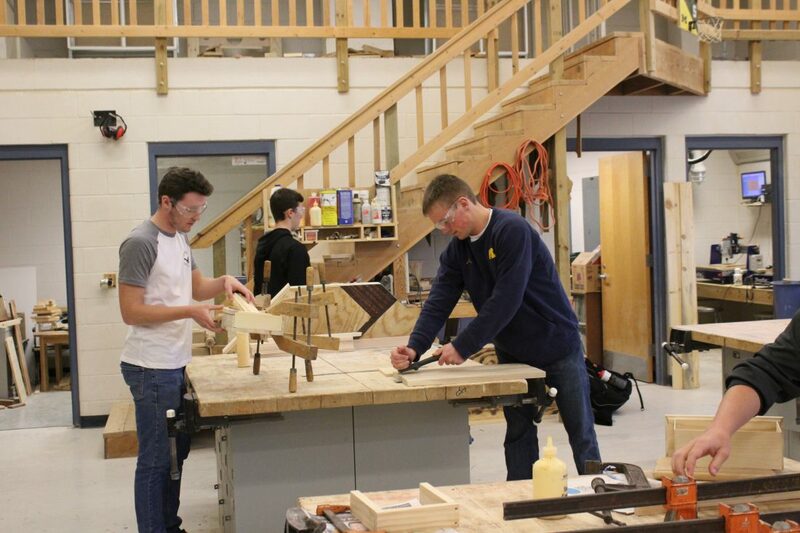 Mason Lachance, a sophomore enrolled in woodshop, said the new program is a positive influence within the classroom as it teaches students to be more mindful of safety and learning how to properly handle the equipment in the shop. “You don’t know, like, if you’re going to get something for (being safe) so I think it helps kids want to be more safe. So they may or may not get rewarded but they don’t know if they don’t be safe. I really think it helps that they do that,” he said. With the help of Assistant ­Principal and Athletic Director Andrew Jacques, Cousineau was able to partner with Verso to provide a reward to the students selected. Cousineau explained Jacques was the one who contacted Verso. “They were really receptive in trying to get involved right away,” Cousineau said. He explained in his experience being in both industry and education, community outreach between industries and schools is extremely important as students are the next generation of workers. Verso donated snowboard/ATV goggles for the students that were selected. Cousineau said Verso also provided new safety glasses and hearing protection for the students to use in the school shop. Six employees from Verso came to the school Thursday to present the students with the new safety glasses and hearing protection while also answering questions and talking about the importance of safety in the workplace. “The team did a great job of presenting and tailoring it to the students,” said Jacques about the Verso visit. Jacques said the students were abuzz with excitement after the event. He explained Verso provided a good message for the students about safety and taking care of each other, which is the culture at Verso. “They speak up amongst themselves to keep everyone safe,” said Jacques about Verso. He added that environment of addressing things peer-to-peer is what they are teaching students at Gladstone, so it helped show students what they’re taught in school will help them in their futures. “We are excited this event happened and want them to come visit the shop every year,” Jacques said. He added, he would love for other businesses to come in and talk with the students like Verso did. The woodshop class at Gladstone isn’t a typical woodshop class either. Cousineau explained with his industry experience he tries to cover different areas of industry in the classroom and provide more background on it. “I try not to make it a straight-up woodshop class. I try to give them some insight as to what’s going to be expected of them when they get out into the industry,” he said. The experiences provided through the class allows some students a creative outlet and break from their core classes. Lachance said he really enjoys taking woodshop as it gives him the ability to work on different projects, like the one he is currently working on in the shop. He said he is working on making wooden Unites States of America flags for his baseball coaches. He explained the shop also provides a space for students to work on different types of projects not necessarily woodshop related. “We don’t have an actual hour for it, but every once in awhile some kids who are good with engines and stuff, they’ll bring over their snowmobiles or four-wheelers and they’ll fix them and get them running again,” he said.